KICK-OFF: Saturday 17 August at 05:30pm. Manchester United began their title defense emphatically with a masterful performance against Swansea at the Liberty Stadium as Robin van Persie and Danny Welbeck both struck the net twice. The rain pouring down on the Liberty Stadium in Swansea definitely got all players off to a slow start, with general scuffling about around the rain and not too much significance, however as the game further progressed, the rain continued to pour but the game got much more lively. Frequency of Manchester United chances increased with Giggs being involved in a few. On one occassion he made a mess of the pass (not a regular occurrence from someone like Giggs) but the chances were still coming. Michu really had a legitimate chance of giving Swansea the lead, when Evra and Ferdinand seemed to stop contributing defense, the shot was hit straight at David De Gea. Things then went quiet again before a poor passback from from Chico Flores almost let Welbeck in, but Vorm was quick to clear. On the 34th minute, Robin van Persie would get off the mark with a superb goal. It was a good ball played into the box, and the Dutchman chested it and it bounced up allowing him to strike it showcasing great acrobatics whilst doing so. Fantastic. Manchester United extended their lead to two goals in quick succession, leaving Swansea struggling severely. Robin Van Persie orchestrated the goal which ended in Valencia playing it accross goal leaving Welbeck to simply tap it in and give Manchester United an affirmative lead. The Champions looked on another level from then on in, silencing the home crowd in Swansea and passing the ball around comfortably. Michael Carrick and Tom Cleverley picked up bookings, Carrick in the 40th minute for a foul that looked much worse than it was due to him slipping in the rain, and Cleverley was booked when he took down Rangel. Nothing came from the free-kick, though. Swansea were desperate for a goal that would drastically change their mentality going into the second half, but nothing really materialized and the half time whistle blew with Manchester United firmly in the lead. Robin van Persie was the main guy throughout the first half, scoring the 1st, and orchestrating the second. The slippy conditions caused by the rain are a problem for players, especially during tackles - hence the four bookings in the first half. Manchester United. Although Manchester United are under a new manager, they are still playing like before, playing just enough to be in the lead. Manchester United went unchanged going into the second half, meanwhile Swansea introduced Wilfried Bony and Pablo Hernandez substituted for Wayne Routledge and Tony Leon Briton. Michu improved from his lackluster first half performance and gave the Manchester United defenders a hard time dealing with the situation. Swansea's play increased the optimism of fans in attendance, with Bony setting up Michu, but a great and courageous block by De Gea kept Manchester United's 2 - 0 lead. Speculation about Rooney's future within the club may have been simmered slightly as David Moyes put on Wayne Rooney in replacement for Ryan Giggs. While Swansea may have been attempting to eliminate the 2-goal deficit, they seemed that they were still in it, giving Rio Ferdinand a hard time too with Bony and Michu both getting involved time and time again. A sensational goal from Robin van Persie pretty much secured the 3 points. Amazing finish by van Persie with a huge shot fizzing into the roof of the net. It may have had Swansea beaten, but it did not stop Bony from a debut goal for Swansea where he picked up the ball from the edge of the box and drilled it to the back of the net. The deficit was back down to two goals. Swansea fans thought they were back in it and made themselves heard. Danny Welbeck further secured the 3 points with a brilliant lob when he came one-on-one with Vorm, a superb finish that gets him his second goal. And the final whistle blew. Manchester United cruise to an affirmative victory beginning their title defense with 3 points. Wilfried Bony - The Ivorian striker showed great signs of play during the match, and a goal on his debut makes it better. A great performance like this in his debut may gain him a lot of fans. Excited to see his next game. Danny Welbeck, Robin van Persie - Both Danny Welbeck and Robin van Persie got off the mark with two goals each in the game. They look set for much more in the season. Robin van Persie - Robin van Persie had a major contribution to Danny Webeck's first goal and two sensational goals for himself that we are likely to see again in a few highlight reels. I am expecting another great season for the star Dutchman. 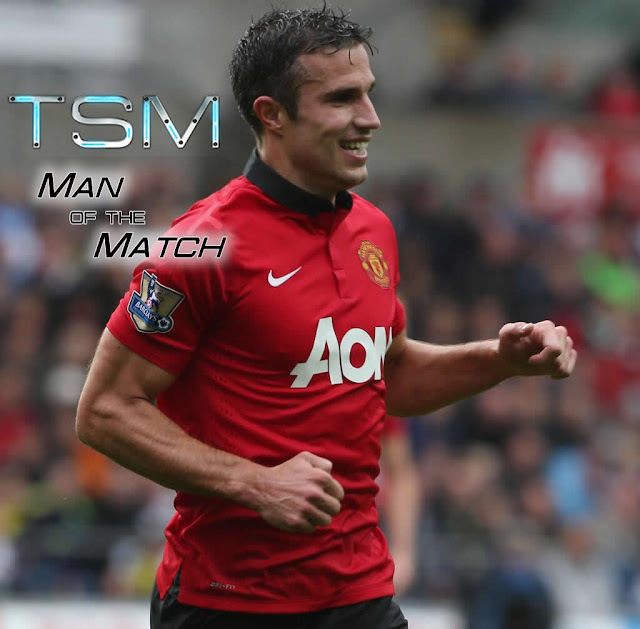 Robin van Persie - Man of the Match. Swansea can take a lot of lessons away from this game, but Manchester United were on a different level today. Superb performance and the Rooney situation has been dealt with for now with him playing. Credit to Swansea for a decent effort but this was a hard start to the season. United have started their season in emphatic fashion. David Moyes' side gets off to a great start in their title defense, completely outplaying Swansea. The Champions and their strikers really turned up. Robin van Persie once again takes the headlines, as Manchester United are on winning ways... as per usual, it seems for now. Coverage, commentary and analysis as part of this match report for the Barclays Premier League match, Manchester United vs. Swansea on 17th August 2013.